Luxury penthouse with stunning sea views in community with indoors and outdoors pools and close to beach and golf course. The property comprises entrance hall, modern fully fitted kitchen with breakfast bar, lounge with patio doors leading on to terrace, main bedroom with ensuite bathroom, shower room and 2nd double bedroom, all rooms with sea views. Centralised air conditioning, underground storage (7m2) and parking space. 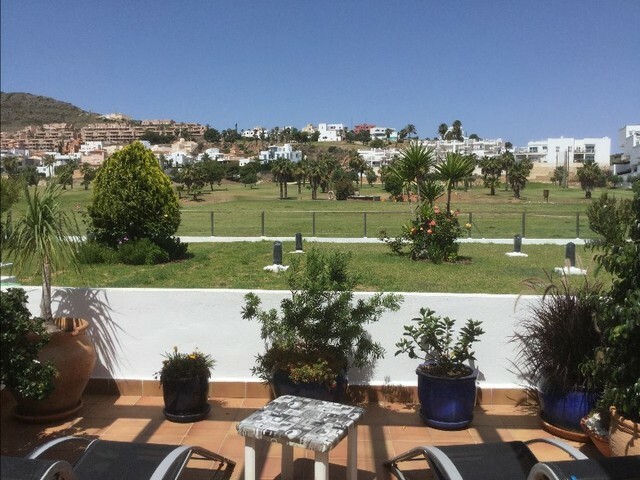 10 minute walk to the beach, all the amenities of Mojacar and Garrucha are a few minutes drive and the local bus stops on the golf complex taking you to Mojacar, Garrucha and Vera. Mojacar: Macenas and Marina de la Torre, Vera: Valle de Este and Cuevas de Almanzora: Desert Springs.